The following is a reproduction of a private e-mail exchange I had with a physicist from the United Kingdom, Frederick David Tombe, for which I got his gracious consent. I hope that the owners of this site won't take it as an abuse, for the content of the exchange might present a public interest. Having lived in the US for almost 20 years, I went back to Russia — my homeland. I am retired now, and I can do whatever I like, whenever I feel like doing it. So, from being employed as a computer programmer for living, I have returned to what I was trained for back in the USSR — mathematics and physics. In the last few years, I have been thinking a lot about the laws of Newton, the foundation of mechanics, and also about Maxwell's equations — the bedrock of electromagnetism. clearly the most insightful paper I have ever read about Maxwell's original theory. Not only that, the paper explained to me why I felt uneasy even with the original equations of Maxwell himself! Looking back, I ask myself: why I had to go through all this suffering? After all, I had some familiarity with your theory of electron-positron sea a few years back, so why didn't I turn to your works for help from the start of my journey? No I see why: only after I have done a lot of thinking on my own in search for the truth I could truly appreciate how deep your theories run — not before that. Now I am hooked for good, so much that I feel ready and willing to translate the complete collection of your papers from English to Russian, and publish it in book format for the benefit of the Russian reader. All I need as your permission to do so. It's good to hear from you again and I hope you enjoy your retirement in Russia. If I had it all to do over again, I would have learned how to speak Russian so that I would now be able to explore your fascinating country. This equation covers everything to do with Newton's three laws of motion, and you are correct that kinetic energy is a definition that follows on from it. You are also correct when you say that Kinetic energy has a real effect (when it interacts with another body). And by the way, I'm hoping like mad for a Donald Trump victory today because I believe that Hillary Clinton is itching for a war with Russia. The EU and the Clintons have been aggressive towards Russia and Serbia since the 90s. It was the EU and Obama who stirred up the trouble in the Ukraine. Many in the UK know this but the mainstream media are pushing a pro-EU and pro-Clinton point of view. One of the reasons why many in the UK want out of the EU is because, as like in 1812, we don't want to be part of a mass invasion of Russia. We've voted to leave the EU but the courts are trying to block the exit. Thank you for your kind words about Russia. How about that American presidential elections; very unusual, to say the least. Anyhow, your wish came true - congratulations! Regarding your paper on Newton's Cradle, I have to study it carefully, and few others it references, before I respond. Have a beer to Trump's victory! Likewise I still have to study your paper on kinetic energy. I had a scan read of it two days ago and it looked very interesting. It was eight pages long. I could see that you were thinking about exactly the same issues that are dealt with in my Newton's Cradle paper. That is, you were going into depth about the energy transfer process in collisions. In the past, I have modelled a body as a set of conjoined bodies, joined by springs and then analysed the two separate motions as in (1) the large scale translational motion, and (2) The internal vibrations. So I will soon get round to reading your paper more carefully. Right now I couldn't because I'm about to fall asleep. I sat up all night watching the American election results coming in. I'm so relieved that Hillary Clinton won't be the president because if she had been she would have tried to obstruct our UK exit from the EU, and tried to embroil us in a war with Russia. Donald Trump talks peace and friendship with Russia, and that's very important. – defied both Newton and Maxwell. I find the concept you call matched (When kinetic energy on the large scale is conserved during a collision, we say that the situation is matched) very interesting. Extremely thought provoking papers to say the least! "The fact that there is no rebound at the point of impact clearly refutes the idea that all motion is only relative. 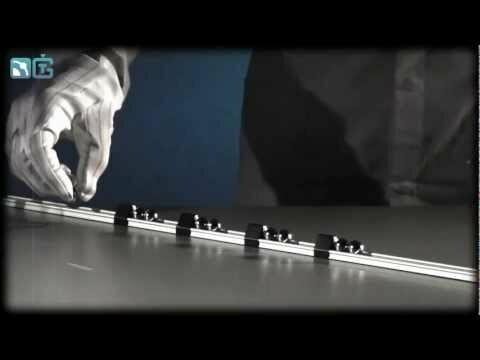 The Newton’s Cradle is an unequivocal demonstration that absolute motion occurs, because the correctly identified direction of the energy transfer within the balls defines the absolute rest frame. Relativity cannot provide a symmetrical physical explanation for the energy transfer process according to whether we treat the single ball as originally being at rest, or the row of balls as originally being at rest. The two situations are simply not symmetrical as would be implied if we were to accept the relativistic belief that all motion is relative. The energy transfer within the balls has to move in a definite direction." You are going against Galileo here - not Einstein. To see that the two situations are precisely symmetrical, all one needs is to consider the situation where there is a small but equal distance δ between the balls in the Newton's Cradle and then pass to the limit δ -> 0. Galilean relativity is based on the apparent observation that symmetry does exist in the above scenario and that we can never tell the absolute motion of any two objects linear motion or in a collision. But the whole point of the statement that I wrote above was to reason, using the example of a Newton's cradle, that both Galilean and Einsteinian relativity are wrong, and that there does exist an absolute basis for kinetic energy, even if it doesn't show up overtly in most case scenarios. Galilean relativity also fails to deal with electromagnetism and the speed of light. It doesn't of course automatically follow then that the luminiferous medium is the same thing as the medium responsible for kinetic energy and the inertial forces, but elsewhere I have argued that both the EM forces and the inertial forces are caused by one and the same medium. As regards my paper "The Aether in Rigid Body Collisions" that I wrote back in 2008, I have been tempted to withdraw it because I no longer believe that the signal speed is instantaneous. My newer article about the Newton's Cradle suggests that the speed is finite and due to a fine-grained rotational wave through the molecules, similar in principle to EM radiation, but differing in speed, medium, and complexity. The only reason why I haven't as yet withdrawn "The Aether in Rigid Body Collisions" is because when I read through it again, I noted that it contained some thought provoking points. But it has been now superseded by the Newton's Cradle paper which I wrote more recently. I don't have any action-at-a-distance now. Electric arcing occurs due to the fact that the circulation is always closed and that when we switch on the power in an electric circuit, the closed circulation expands outwards from the power source contained by both the outward and the return limb. It crosses the gap, causing the gap to become linearly polarized. You would be better to read the papers that appear top of the list here, as some of those ones written back in 2007 and 2008 were early attempts to tackle such tricky issues, and hadn't as yet been fully resolved. The paper "The Aether in Rigid Body Collisions" is thought provoking, indeed, David. Here are some "provocations" it triggered in my mind. This cradle, evidently, is finite in length. Where in the row will this cradle break? Right after the first ball, perhaps. Will the balls in the cradle match? Probably not. What is the criterion for two balls of different size, mass, and elasticity to match? Now consider another cradle with infinite number of balls, but decreasing in diameter: D1=1, D2=1/2, D3=1/3, m4=1/4, m5=1/5, ... This cradle, evidently, is of infinite length for 1+1/2+1/3+1/4 + ... goes to infinity as log. Where in the row will this cradle break now? What distribution of velocity over the balls would we get after the dust settles, so to speak? I did not run the calculations, but it seems to me that the velocity of the infinitely small ball at the end of the row would fly off with infinitely large velocity. Basically we might have here an interesting idea for a new gun which delivers a transfer of large part of energy from a big ball to a small bullet, effectively concentrating (focusing, zooming in, microscoping - pick your choice of wording) the energy. The issues which you have raised are fascinating questions in classical mechanics which are ignored by mainstream. Mainstream arrogantly teach that classical mechanics is a closed topic about which everything is known. But everything is not known. Far from it in fact. On the issue of matching, I don't know the definitive answer, but I think that two matching balls have to be identical is every respect, as in mass, shape, size, and elasticity. The whole thing about matching in my opinion is that the fine-grained vortex wave passes through, and no linear deformation occurs, and hence no kinetic energy on the large scale is lost. I suspect that in the two case scenarios that you have suggested, that these are not matched, and that hence the incoming ball will recoil, and that internal energy will be lost to linear deformation waves. Nevertheless, your scenarios did make me think about the vortex cannon. As regards the videos that you sent me, in the first one, I can't figure out what must have happened because I didn't have enough information about relative masses etc. But it looked very counter-intuitive to me. Did the fast ball at the end have less mass than the incoming ball? If so, then there will be something to be learned from the experiment regarding that no deformation occurs when the balls are the same size, but different densities. Anyway, getting back to my earlier point about the Newton's Cradle disproving Einstein, the argument runs like this. If the effect is transmitted down the row at a finite speed, as I believe it must be, then there is a difference as between the situation when the single ball moves into the row, and when the row moves into the single ball. The difference will be in the time taken for the row to split again. For example, if ten balls together are moving and crash into a single ball, then the rear ball will split after the time that it takes for the energy to move up into the single target ball at the other. That's only the time to travel the length of one ball. However, if the single ball moves into the row, then the ball at the far end will not move off until the energy from the incoming ball has travelled the full length of the row. The point here is that absolute motion is logically argued as a fact, even if we can't pin down exactly which of the objects are actually the ones that are engaged in absolute motion, and/or to what partial degree. But logic dictates that absolute motion is involved beneath the surface of what we are observing. If there is no absolute motion, as per Einstein, the signal through a Newton's Cradle must be instantaneous. And the same criticisms apply to Galilean relativity which quite simply fails to consider either the luminiferous medium, or an inertial medium (which for other reasons I believe to be one and the same medium). I don't think that considering a small gap, tending to zero, between the balls addresses the point that I am making about the transit time of the signal. I'm convinced that the solution to the Newton's Cradle mystery, albeit that mainstream don't acknowledge it as a mystery, lies in the fact that two kinds of waves are involved in collisions. (1) Deformation waves which begin at the expense of kinetic energy on the large scale, and (2) fine-grained rotational/vortex waves which involve the lossless transfer of kinetic energy in matched situations. Our views on what is really happening in the collision of solid (but still elastic) balls diverge, David. And that is not bad. Quite the contrary - it is good. Indeed, if our views coincided completely (which is contrary to the nature anyways) nothing new could come out of our interaction. Gradient, i.e. some kind of difference, is the seed of birth; there is no gradient, there is no birth. You said: "On the issue of matching, I don't know the definitive answer, but I think that two matching balls have to be identical is every respect, as in mass, shape, size, and elasticity. The whole thing about matching in my opinion is that the fine-grained vortex wave passes through, and no linear deformation occurs, and hence no kinetic energy on the large scale is lost." We could use this statement of yours to decide experimentally whose understanding of the process of elastic collision fits the bill better. where D - ball diameter, ρ - material density, K - bulk modulus of elasticity, G - shear modulus of elasticity. I would not dismiss Galileo's principle of relativity so hastily as well - it is good as far as it goes. It seems to me that you attribute too much weight to the fact that the hitting ball stops dead in the Newton's Cradle. But the hitting ball stops dead in simple collision of two identical balls as well. That's where the symmetry, I was talking about earlier, comes from. What do I mean when I say: Galileo's principle of relativity is good as far as it goes. Consider yourself on the rail track and a train rapidly approaching you. The signal (screeching air waves) from the approaching train will reach your ears much earlier than the train hits you. But you will not "move" (if you fail to heed the warning signal, of course) until the train hits you. But the ball is dumb - it will always fail to heed the incoming warning of electromagnetic signal, and won't move until another, more powerful "wave" hits it, which it won't be able to ignore, no matter how dumb it is. Now comes the punch line: but we are absolutely sure that the weak, warning signal is coming from the train - not from the ball! That is where Galileo's principle of relativity breaks down. No, no, no .... let me take it back. It is more appropriate to say: Galileo's principle of relativity does not break down - Galileo's principle of relativity is good as far as it goes. I gave more thought to your first video last night and I was reminded of something that I had forgotten about. Kinetic energy can be conserved, but is not necessarily conserved, in non-matching collisions, providing that there is no coalescing. Whether or not it is conserved will of course depend on the coefficient of restitution. Because the explanations in your first video were in Russian, I was unable to fully see what was happening. But let me guess. Were the balls in the row progressively less dense? In which case, the transferred velocity became progressively greater? Is that what was happening? If so, then we need to distinguish between collisions where kinetic energy is conserved on the one hand, and matched collisions on the other hand, the latter being merely a special case of the former where objects have the same mass (although perhaps they could still have a different volume and a different density and indeed a different elasticity, as you have pointed out). On Galilean relativity (which pertains to linear motion, but not to rotational motion), yes it holds superficially, providing that we ignore the medium that is responsible for inertial (and electromagnetic) phenomena, and Galileo did ignore that. If we ignore that medium and we ignore the underlying sub-atomic physical explanation for kinetic energy in conjunction with that medium, then yes, it's impossible to determine which of two objects in relative linear motion are in absolute motion, and to what degree. We can solve all those basic linear motion problems within whichever reference frame we choose. Regarding your questions: "Because the explanations in your first video were in Russian, I was unable to fully see what was happening. But let me guess. Were the balls in the row progressively less dense? In which case, the transferred velocity became progressively greater? Is that what was happening?" Yes, it was a Gauss rifle, but not a pure Gauss rifle which uses the same projectile all the way through. It was a mixture between a Gauss rifle and a Newton's cradle. It used a relay of balls. 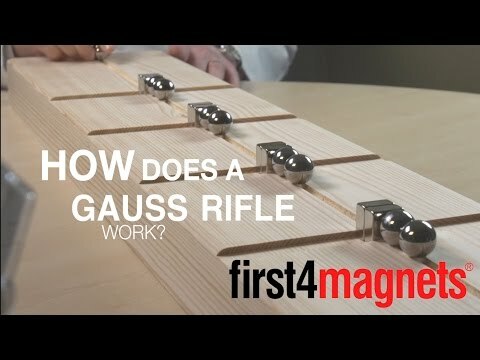 I wonder would that exact same set up work identically if the magnets were simply replaced by non-magnetic metal barriers, and each progressive ball kept getting lighter? I believe it would, David. Here is why I think so. Take a football size rubber ball pumped with air tight and drop it to the floor from 1 meter height. It will bounce back to a height somewhat less than 1 meter. Do the same with another rubber ball of tennis ball size. It will also bounce back to a height less than 1 meter. Now put the small ball on top of the big one and drop them together from the same height of 1 meter. What will happen? The small ball will skyrocket, so to speak. Give it a try. This is not the same setup, of course. But you get the idea. To achieve high exhaust velocities, what the rocket people do? They give the exhaust nozzle a special form called Laval nozzle. In the case of liquids we can use cone shaped nuzzle. So, what shall we do in the case of solids? You know the answer now. OK, so we have now established that kinetic energy transfers between bodies during a collision, and that the transferred velocity increases as the mass of the receiver body decreases. (1) Galilean and Einsteinian relativity both deny absolute velocity. They both ignore the issue of whether or not there exists an inertial medium and/or a luminiferous medium, or both all in one. And so long as we analyse linear motion on that limited level of detail, then Galilean relativity appears to be correct. My argument in the Newton's Cradle article is that if Galilean and Einsteinian relativity are correct, then, due to symmetry, the kinetic energy must transfer instantaneously. That's why I made the error in my 2008 paper "The Aether in Rigid Body Motions". (2) The second issue is that when collisions occur, the physical effects can be segregated into two kinds. (i) A deformation which dissipates as heat, and (ii) a kinetic energy wave, which in my opinion is in the same genre as EM radiation, but differs in density and complexity, as it is based on the atoms and molecules of the material, whereas EM radiation is based on the much smaller molecules of the luminiferous medium. The former does of course through interact with the luminiferous medium. Take for example a row of weights on a frictionless surface attached together by springs. If we push it at one end, two completely separate things happen. (i) There will be an oscillation wave set up in the system, and (ii) the system as a whole will move linearly and the effect at the far end will seem to be instantaneous, although it is almost certainly not instantaneous. The kinetic energy wave is not a deformation wave and so it must be a fine-grained rotational wave inside the material, and which interacts centrifugally with the luminiferous medium. We are on the same page on the issue (1). The issue (2) requires some minor clarifications, in my opinion. Quote: (2) The second issue is that when collisions occur, the physical effects can be segregated into two kinds. (i) A deformation which dissipates as heat, and (ii) a kinetic energy wave, which in my opinion is in the same genre as EM radiation, but differs in density and complexity, as it is based on the atoms and molecules of the material, whereas EM radiation is based on the much smaller molecules of the luminiferous medium. The former does of course through interact with the luminiferous medium. On (i). If the collision is matched then there shall be no energy loss to dissipation. Otherwise, each of the two colliding balls will be left, after the collision, with some residual deformation waves that will be bouncing back and forth from ball boundaries. These residual waves could last forever if not for the friction between the molecules, which, yes, leads ultimately to energy dissipation in the form of heat. On (ii). This statement requires only one change to reflect my views. I would rather say: (ii) a residual deformation wave resulting from unmatched collision (not the kinetic energy wave! ), is in the same genre as EM radiation, but differs in density and complexity, as it is based on the atoms and molecules of the material, whereas EM radiation is based on the much smaller molecules of the luminiferous medium. The former does of course through interact with the luminiferous medium. As of the kinetic energy wave, it is much like EM wave but in a different "medium", and that "medium" is not comprised of the atoms and molecules of the ball material, as you have assumed, but of the entire balls. In other words, the "medium" is the chain in Newton's Cradle, where the balls play the role of "atoms and molecules" of the "medium". Now I shall remove the quotation marks and speak of medium, period, because that's what it is. The aether does not have more rights to be called medium than the mechanical medium of balls has - the difference consisting mostly in the scale. And I am a firm believer in the scale invariance of the laws of nature. Quote: Take for example a row of weights on a frictionless surface attached together by springs. If we push it at one end, two completely separate things happen. (i) There will be an oscillation wave set up in the system, and (ii) the system as a whole will move linearly and the effect at the far end will seem to be instantaneous, although it is almost certainly not instantaneous. Yes, the effect at the far end (as long as we speak of the effect of the movement of the last ball as a whole!) is certainly not instantaneous. What is more, the speed of that process is not that high either: it is not in the order of the speed of light (as you seem to believe) but rather somewhere in the range of 3 - 6 km/s, i.e. the speed of deformation waves in steel material. David, do you have access to some laboratories, where experiments can be carried out? Where do you live, where do you work? Do you have some experience in writing patent applications?